PDF here. More on this collective here. PDF here. More on this collective here. .
Joaquin has been known to us for some years now as a voice of militancy and reason in the Los Angeles area, working with Cop-Watch LA, Anarchist People of Color, and Revolutionary Autonomous Communities. His arrest at the end of June on a felony charge of possession of a concealed weapon – a legally-purchased firearm kept in the boot of his car while he was driving it – appears to be concocted by members of the Los Angeles Police Department who have come under the uncomfortable community scrutiny of Cop-Watch Los Angeles. The felony possession charge is a serious one as it carries a prison sentence and bail has been set at an exorbitant $40,000 (almost R315,000), which is obviously designed to keep him behind bars awaiting arraignment. The community is attempting to raise bail, but Joaquin’s arrest demonstrates quite clearly the hurdles that police – with no genuine case against their suspect – are prepared to throw in the face of ordinary people who simply demand the democratic right to ensure that the police do not abuse their powers. Joaquin is obviously known and intensely disliked by the LAPD and every minute he is in their custody, his life is at risk. We demand that the bogus charge against him be dropped immediately and that he be returned unharmed to his community. We call for an international campaign by progressive and community organisations for his release. 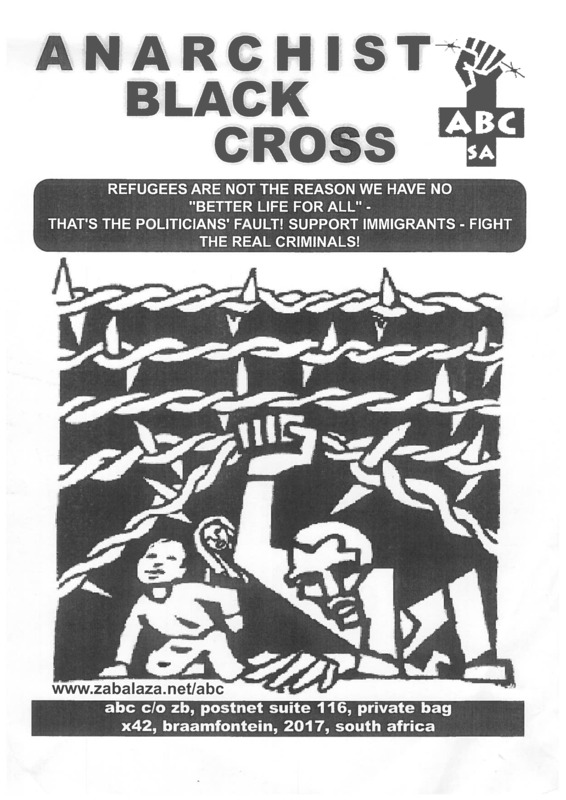 The August 2003 third issue of Black Alert was billed as the publication of the Anarchist Black Cross-Anti-Repression Network (ABC-ARN). It included a proposal for a formal multi-tendency / non-sectarian ARN, within which the ABC would continue to produce Black Alert as an ARN publication. By this stage, the ABC was a “member collective” of the Zabalaza Anarchist Communist Federation (later Front, the ZACF), formed in May. 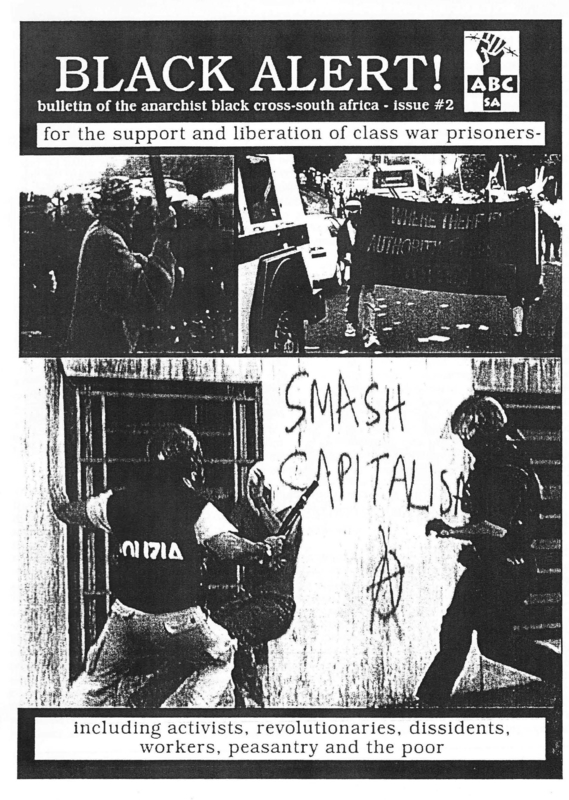 We believe that only through anti-authoritarian, directly-democratic, decentralised and nonhierarchical organisation(s) and means of struggle will we be able to counter and overcome international repression, which is undoubtedly going to get worse as our struggles advance, by making it difficult for the repressive forces of the State to infiltrate our movements and imprison or remove our ‘leaders’. because we are all leaders. Through these means of organising we will be able to build a decision-making structure from the bottom up and not the top down, as is presently the case. A structure that will be strong enough both to combat the coming repression and overthrow the system of capitalism as a whole, which puts the wealth and power of a few before the lives and needs of billions. The Anti-Repression Network is non-sectarian and open to any groups, communities or individuals who have already, or could fall victim to State repression. Our aim is to spread awareness around the issues of political repression in Southern Africa and. more importantly, via practical aid to its victims. to build a community of resistance willing to support communities and activists who find themselves targeted by the State, capital or their agents for the roles they play in building a new world or simply defending their homes. In other words … YOU ARE THE ANTI-REPRESSION NETWORK. Right then, let’s get on with it. The future can and must be ours! 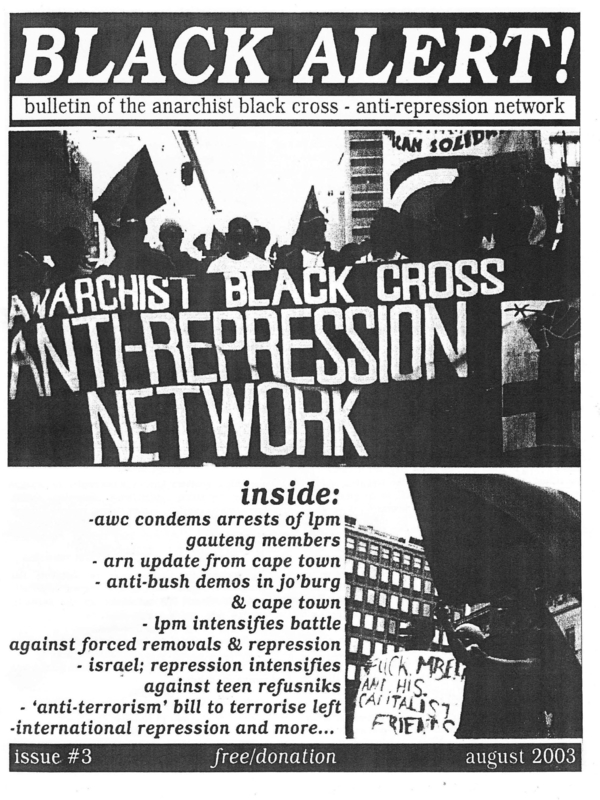 Black Alert was the bulletin of the Anarchist Black Cross- South Africa (ABC-SA), a project that was linked to Bikisha Media Collective, Zabalaza Books and the Zabalaza Action Group (in Durban). These groups later merged into the Zabalaza Anarchist Communist Federation (later, Front) in May 2003: more on the ZACF here. Both Black Alert and the ABC-SA continued to operate as a ZACF project. 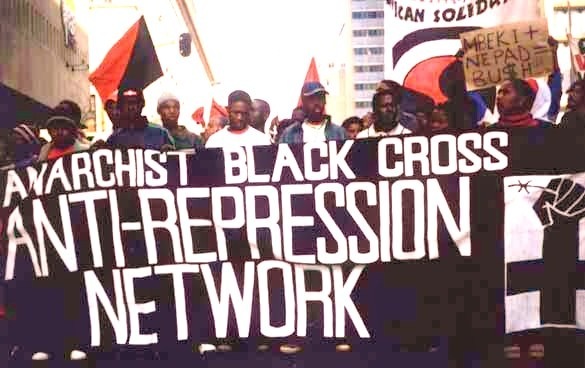 The Anarchist Black Cross is an international anarchist prisoner support network, operating worldwide, dating back to the start of the twentieth century. Issue 2 of Black Alert mainly comprised reprints of statements and appeals by South African community movements, mixed with some international material.